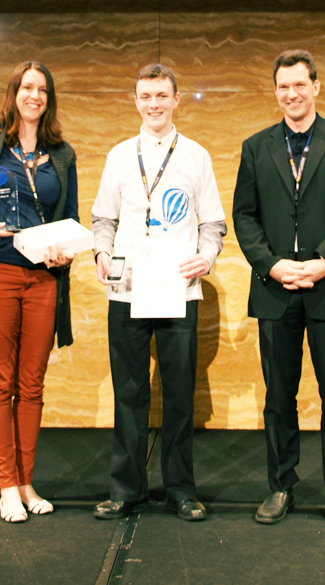 Accepting my award for first place in the YICTE competition, 2012. Hello there, I'm Deinyon Davies - a B Science in Game Development student and technologist. Welcome to the exciting Web Systems world of Deinyon Davies (11688025). Check out My Past, My Future and this website's comments for more information on me; because after all, that's what this site is all about... me! I have experience in C/C++ on multiple platforms (including legacy gaming consoles such as the Sony PlayStation 1), C#, Java, PHP, HTML, CSS, PWN, Arduino and some x86 assembly. I also enjoy 3D computer graphics; both real-time and ray-traced rendering technologies, and have both hobby and work experience in Autodesk 3Ds Max and Chaosgroup VRay.